Frontotemporal dementia (FTD) phenotypes have distinctive and well-established cortical signatures, but their subcortical grey matter profiles are poorly characterised. The comprehensive characterisation of striatal and thalamic pathology along the ALS-FTD spectrum is particularly timely, as dysfunction of frontostriatal and cortico-thalamic networks contribute to phenotype-defining cognitive, behavioral, and motor deficits. Ten patients with behavioral-variant FTD, 11 patients with non-fluent-variant primary progressive aphasia, 5 patients with semantic-variant primary progressive aphasia, 14 ALS-FTD patients with C9orf72 hexanucleotide expansions, 12 ALS-FTD patients without hexanucleotide repeats, 36 ALS patients without cognitive impairment and 50 healthy controls were included in a prospective neuroimaging study. Striatal, thalamic, hippocampal and amygdala pathology was evaluated using volume measurements, density analyses and connectivity-based segmentation. Significant volume reductions were identified in the thalamus and putamen of non-fluent-variant PPA patients. Marked nucleus accumbens and hippocampal atrophy was observed in the behavioral-variant FTD cohort. Semantic-variant PPA patients only exhibited volumetric changes in the left hippocampus. 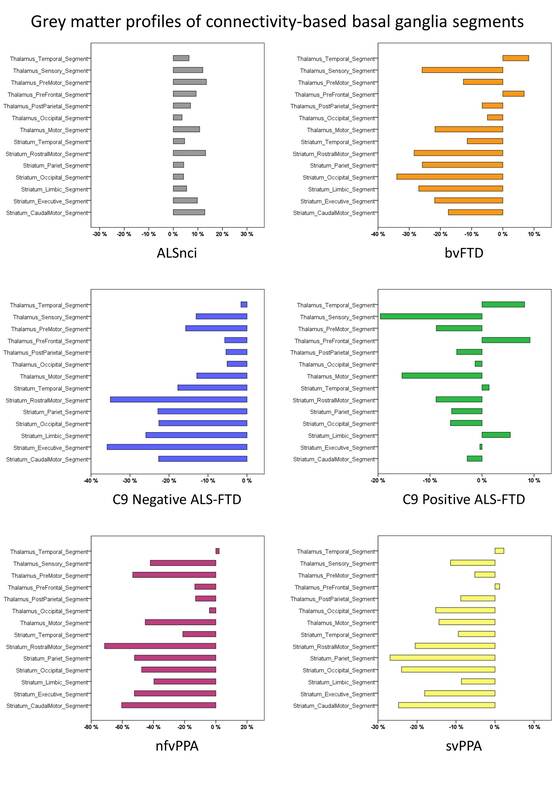 C9-positive ALS-FTD patients showed preferential density reductions in thalamic sub-regions connected to motor and sensory cortical areas. C9-negative ALS-FTD patients exhibited striatal pathology in sub-regions projecting to rostral-motor and executive cortical areas. The bulk of striatal and thalamic pathology in non-fluent-variant PPA patients was identified in foci projecting to motor areas. Subcortical density alterations in svPPA patients were limited to basal ganglia regions with parietal projections. Striatal and thalamic changes in FTD exhibit selective, network-defined vulnerability patterns mirroring cortical pathology. Multi-modal cortico-basal imaging analyses confirm that the subcortical grey matter profiles of FTD phenotypes are just as distinct as their cortical signatures. Our findings support emerging concepts of network-wise degeneration, preferential circuit vulnerability and disease propagation along connectivity patterns. The online version of this article ( https://doi.org/10.1007/s11682-018-9837-9) contains supplementary material, which is available to authorized users. We gratefully acknowledge the kindness and generosity of our patients and their caregivers. This work was supported by the Health Research Board (HRB – Ireland; HRB EIA-2017-019), the Irish Institute of Clinical Neuroscience IICN − Novartis Ireland Research Grant, the Iris O’Brien Foundation, the Perrigo Clinician-Scientist Research Fellowship, and the Research Motor Neuron (RMN-Ireland) Foundation. This study was funded by the Health Research Board (HRB – Ireland; HRB EIA-2017-019), the Irish Institute of Clinical Neuroscience IICN − Novartis Ireland Research (IICN – 2016), the Iris O’Brien Foundation, the Perrigo Clinician-Scientist Research Fellowship, and the Research Motor Neuron (RMN-Ireland) Foundation. Peter Bede declares that he has no conflict of interest. Taha Omer declares that he has no conflict of interest. Eoin Finegan declares that he has no conflict of interest. Rangariroyashe H. Chipika declares that she has no conflict of interest. Parameswaran M. Iyer declares that he has no conflict of interest. Mark A. Doherty declares that he has no conflict of interest. Alice Vajda declares that she has no conflict of interest. Niall Pender declares that he has no conflict of interest. Russell L. McLaughlin declares that he has no conflict of interest. Siobhan Hutchinson declares that she has no conflict of interest. Orla Hardiman has received speaking honoraria from Janssen Cilag, Biogen Idec, Sanofi Aventis and Merck-Serono, she has been a member of advisory panels for Biogen Idec, Allergen, Cytokinetics, Ono Pharmaceuticals and Sanofi Aventis. All procedures performed in studies involving human participants were in accordance with the ethical standards of the institutional (Ethics (Medical Research) Committee - Beaumont Hospital, Dublin, Ireland) and with the 1964 Helsinki declaration and its later amendments or comparable ethical standards. Bede, P., & Hardiman, O. (2017). 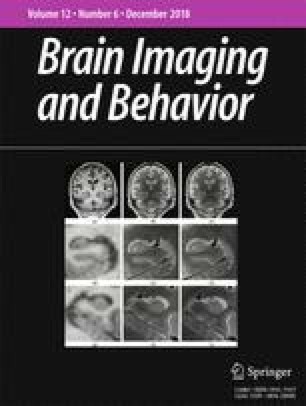 Longitudinal structural changes in ALS: a three time-point imaging study of white and gray matter degeneration. Amyotrophic Lateral Sclerosis Frontotemporal Degenerative, 1–10, https://doi.org/10.1080/21678421.2017.1407795. Bede, P., Iyer, P. M., Schuster, C., Elamin, M., McLaughlin, R. L., Kenna, K., et al. (2016). The selective anatomical vulnerability of ALS: ‘disease-defining’ and ‘disease-defying’ brain regions. Amyotrophic Lateral Sclerosis Frontotemporal Degenerative, 1–10, https://doi.org/10.3109/21678421.2016.1173702. Fischl, B., & Dale, A. M. (2000). Measuring the thickness of the human cerebral cortex from magnetic resonance images. Proceedings of the National Academy of Sciences, 97(20), 11050–11055, https://doi.org/10.1073/pnas.200033797. Omer, T., Finegan, E., Hutchinson, S., Doherty, M., Vajda, A., McLaughlin, R. L., et al. (2017). Neuroimaging patterns along the ALS-FTD spectrum: a multiparametric imaging study. Amyotrophic Lateral Sclerosis Frontotemporal Degenerative, 1–13, https://doi.org/10.1080/21678421.2017.1332077.